← No Day but Today…. This post is a tribute for June as she spreads her wings and flies into the new role of Rector at St. Andrew’s. Your presence with us at St. Thomas will be missed, but your loving spirit still fills this space and will keep us connected in divine love and grace. There were many experiences of prayer in the Pentecostal church in which I was raised, but I can honestly say that none of them involved prayer beads. Older women I knew in the neighborhood had rosaries, though, and my grandmother had one lovely set in her jewelry box that had belonged to someone in the family of an earlier generation. Later, in college, I would visit my 90 year old Sicilian neighbor from whom I rented a shared garage, and she would sit at her kitchen table with coffee, anisette cookies and her rosary beads asking me to pray with her and keep her company on the first day of the month when I came knocking with my $50 cash. I did find a set of beads and learned to say the rosary with her, mostly because I was afraid she would stop renting to me if she learned I wasn’t Catholic. In spite of that overly pragmatic introduction into beaded prayer, it remained fascinating to me. I was always drawn to that which was unfamiliar and beautiful, so the crucifix on the end of lovely, colored beads was something that seemed ancient and mysterious, whether tucked in a jewelry box or wrapped around Mrs. Latona’s aging hands and reverently nimble fingers. Like mass cards and tall votives with pictures of saints, beads were part of the mysterious world in which other people prayed. Prayer has taken many years to grow on me, though. Or perhaps, it has taken me many years to grow into prayer. I was at a parish retreat at Shrinemont on a rainy weekend, along with my daughter, when beads entered into my own world of prayer. June, our Assistant Rector who has ALWAYS been an ingenious planner of activities for children of all ages, had designed a prayer bead making workshop. For the grown ups, she brought books that explored prayer beads across faith traditions. She gave instructions and history about prayer beads in the Anglican tradition. She had gleaned plastic pony beads for kids, lovely glass and ceramic beads and even a random selection of totally unique beads from necklaces that had been disassembled into their component parts. We all beaded together while the rain came down outside, selecting and sharing beads and spontaneously talking about who and what we were praying for as we built each unique strand. 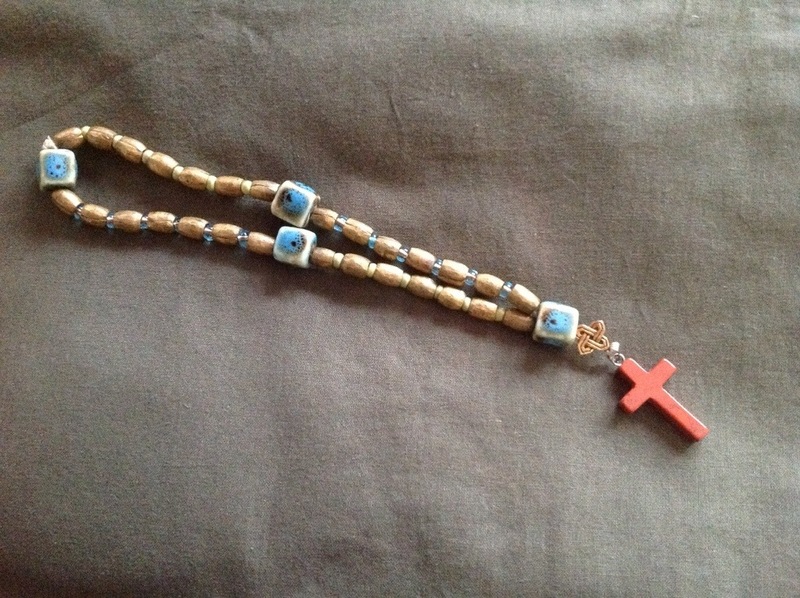 I made my first prayer beads that year from bronzed metal beads that June had recovered from a necklace bought during some of her travels, along with four lovely ceramic cruciform beads which my fingers were drawn to slide over. I selected a simple and lovely wooden cross, then a Celtic knot as my invitatory bead. I decided on natural fiber to string them together. My own prayers, the longing and grateful thoughts of my heart, began to slip between each bead as the circle took shape. I held them in my hand when I was finished, taking in with the beads the stories shared with my faith community that had been a part of their emergence. These beads have been my companion ever since, and a daily practice of contemplative prayer began to emerge for me. Most recently, my prayer beads accompanied me on a prayerful weekend retreat where they were my touchstone of faith in community as my own vocational path and spiritual journey grows and emerges, step by step and day by day. But this prayer bead story doesn’t stop there. Each year at retreat, a group of us has gathered to string prayer beads. Each time, those of us who were experienced brought beads to share with those newly joining the group. My daughter and I collect and purchase beads throughout the year, saving up a supply to share them with others. June has been there to tell the stories of prayer beads she has made for others, beads she has spontaneously given away, beads that found their home to people exactly when and where they were most needed. I have made beads specifically with a friend in mind, offering up my heart prayers for them as I string. I have strung together other circles with the prayer that they would find a home where and when they were needed. Last year on retreat, I made one strand of beads with this last intention, simply that the beads would be a blessing to whomever they found their way. I had these newly made prayer beads with me just before I left the retreat, tucked into my coat pocket. I decided to walk the labyrinth while my daughter had one last, playful romp with her friends. As I journeyed into the labyrinth, I thought of my prayer beads and intuitively reached into my pocket, said a prayer of blessing for whomever would find them, and left them at the center. I walked the path out of the labyrinth with my mind and heart open, listening for the wisdom I would receive to guide the steps of my own journey. Over the past year, I have periodically thought of the prayer beads I left on the labyrinth and whenever I do, I have offered up a momentary prayer of blessing for whomever was holding them. It is a connection of divine trust and grace, to not know for whom you are praying but to hold them in prayer, regardless. I have come to know that this most ancient of practices is a blessing to myself and to others, not necessarily related to any intercessory outcome, but simply because of the immense power of connection in which the divine can be experienced. Quite unexpectedly, I was recently given the gift of knowing who has been holding those beads, and we were both moved to tears from the power of this shared experience. I realized the deep and profound wisdom that June had been sharing with us: our prayers will find their way to those who need them. We are all journeying together, each giving and receiving exactly as we are. This is a most profound blessing for those who give, and for those who receive. And we are each one of us…all of us…doing both. This year on retreat, I made a strand of blue crystal beads, with deep blue and green stones. I offered prayers of thanks, gratitude, and hopeful expectation as I added each bead. I was praying for and thinking of one person in particular. I realized as I was nearly done with the strand that while the finished piece was beautiful, I had forgotten one cruciform bead at the very beginning point. As I began to berate myself, I felt a calmness come over me and I laughed. This beauty mixed with imperfection was a perfect symbol of our faith community. We have a beloved chaos in our worship, and the inspiration of our hearts often surpasses our quest for logical order and perfect form. We are a beautiful, holy mess. And it is in the radically loving acts of leaders like June that I have come to see the divine not in spite of the chaos, but because of it. Whether it is the cacophony of a Christmas pageant or an Alleluia Easter egg hunt, or the quiet space of an advent tent for stillness in which our beloved children are anything but still, June is there to see and illustrate where God is in our midst, persistently and presently. My gratitude for that lesson she has taught me more than surpasses the missing bead. In fact, that might be the most beautiful bead of all in its invisible presence. Just like God. I gave June her prayer beads that day, just as I carry my own set, strung with the beads and stories and prayers that she has given to me. I know we will be praying for each other. And in that divine connection, we will both be blessed. And in her presence within our community, we have all been blessed indeed. This entry was posted in Who is My Neighbor?, work and life and tagged connection, contmplation, divine, faith, inspiration, prayer, prayer beads, Serendipity. Bookmark the permalink.